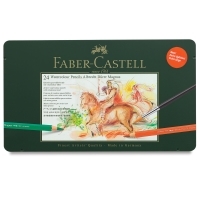 The Albrecht Dürer artists' watercolor pencil has been prized by creative minds around the world for its exceptional properties. Now it has a big brother — the Albrecht Dürer Magnus! A very soft, large 5.3 mm core offers smooth, vibrant laydown, ideal for large-scale drawing and for covering large areas quickly. 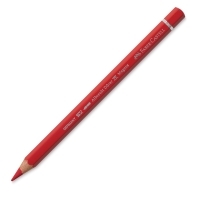 The voluminous pencil shape is gentle on the wrist for fatigue-free drawing, even after long sessions. 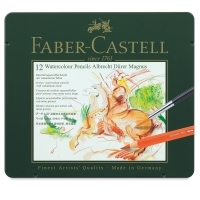 Every color in the Albrecht Dürer Magnus range is very lightfast. 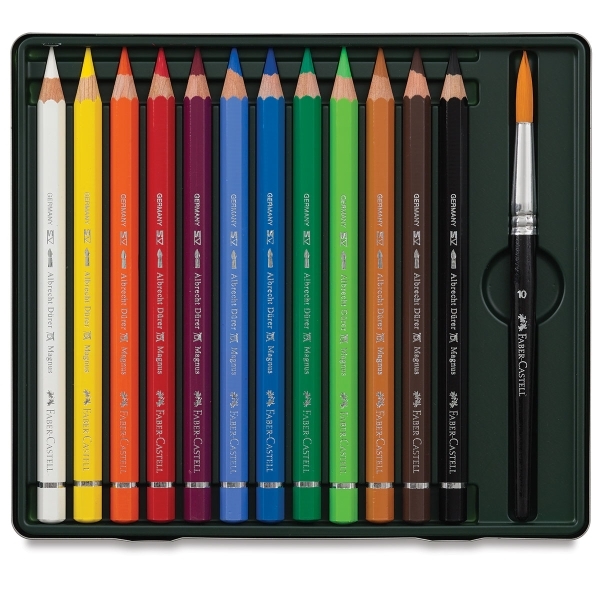 Gift Set of 16 — Packaged in a handsome, heavy duty cardboard box this set contains 12 watercolor pencils, a 2B Graphite Aquarelle Pencil, 1 waterbrush, 1 dual pencil sharpener, and a dust-free eraser. The colors included are White, Cadmium Yellow, Dark Cadmium Orange, Deep Scarlet Red, Light Ultramarine, Phthalo Blue, Dark Phthalo Green, Emerald Green, Light Green, Burnt Ochre, Walnut Brown, and Black. 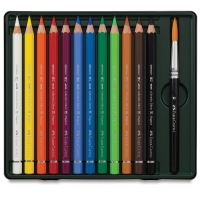 Set of 24 — This set includes 24 pencils, one of every color in the line, plus a Size 10 watercolor brush. 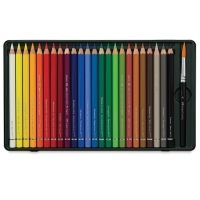 Set of 12 — This set includes one each of 101 White, 107 Cadmium Yellow, 115 Dark Cadmium Orange, 219 Deep Scarlet Red, 133 Magenta, 140 Light Ultramarine, 110 Phthalo Blue, 163 Emerald Green, 171 Light Green, 187 Burnt Ochre, 177 Walnut Brown, 199 Black, and a Size 10 watercolor brush.